The mechanism through which the entrepreneur pursues unlimited acquisition of wealth is his enterprise. It may produce what it sells or simply resell what it buys. The things it sells may be products like washing machines, or services like washing clothes. The entrepreneur does not do the work of producing or selling these things himself. He does not make the washing machines with his own hands. His workers do it for him in return for their wages. However since he owns the enterprise, he alone controls what it does. Therefore, it is nothing other than an all-powerful ext­ension of his own body and mind. 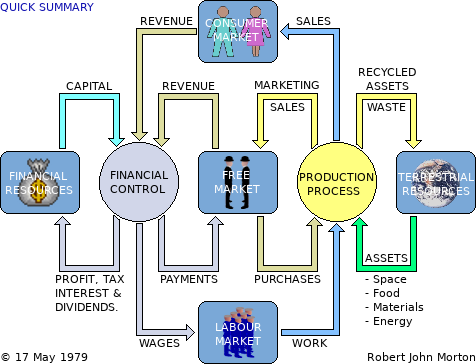 Below is a simplified flow-model of a modern enterprise. The yellow, green and blue arrows show the flow of real resources like materials and labour. The light blue (cyan) and mauve (magenta) arrows show the counterbalancing flow of money, which is a representation of the real materials and labour which the rest of society currently owes the enterprise. The enterprise is kicked into life by injecting it with the money or resources-in-kind necessary to start it off. The entrepreneur must generally supply at least part of this from his personal means. He may obtain more from whoever else he can persuade to contribute. These are his investors. It is most unlikely, however, that the entrepreneur and his investors will be able to raise sufficient capital to kick-start the enterprise. The entrepreneur will thus invariably have to borrow a significant proportion of the starting capital from a bank. The entrepreneur, his co-investors and the bank thus become, in effect, the enterprise's financial environment. 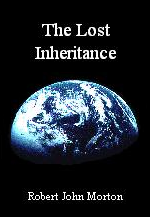 The starting capital is then put under the enterprise's financial control system. This capital is then used to supply the wages and payments to purchase labour (work) and materials. The central element of the enterprise is the free market. This is the subsystem which transmutes money into labour and labour into money. Materials are, in effect, nothing other than stored labour. The purchased labour and the enterprise's other resources are then used in a pro­duction process to work the purchased materials into finished goods. These are then sold into the free market which transmutes them back into money or revenue. This is hopefully more than was spent in purchasing the labour and materials that were used to produce them. Part of this revenue is then used to buy more labour and materials thus enabling the enterprise to sustain itself and grow. A further part goes to pay interest and taxes. The rest of this revenue goes to the entrepreneur and his co-investors as their annual profit on their initial capital investment.